In 2002, when almost all memory of Kameda as a town of textiles had faded, a kamedajima swatch book was discovered in the collections of the Kameda History Museum, and the last two textile manufacturers remaining in the region began working to revive kamedajima. The goal of the revival was not merely to recreate kamedajima’s simplicity, warmth, and durability, but also to pursue the flexibility required of a long-wearing fabric suited to modern life. To recreate kamedajima’s traditional texture the characteristics of the yarn, the weaving and dyeing techniques, and the finishing process all had to be thoroughly researched. The research began with a thread-by-thread analysis of the yarn composing the fabric, followed by an inquiry into the best material for recreating the strength and texture. The weaving methods, weave density, and dyeing techniques for recreating the characteristics of traditional stripes were also carefully examined. This nearly obsessive amount of research and testing finally led to the 2005 revival of kamedajima—a fabric marked by traditional simplicity and warmth, as well as the durability and flexibility necessary to stand the test of use and time. 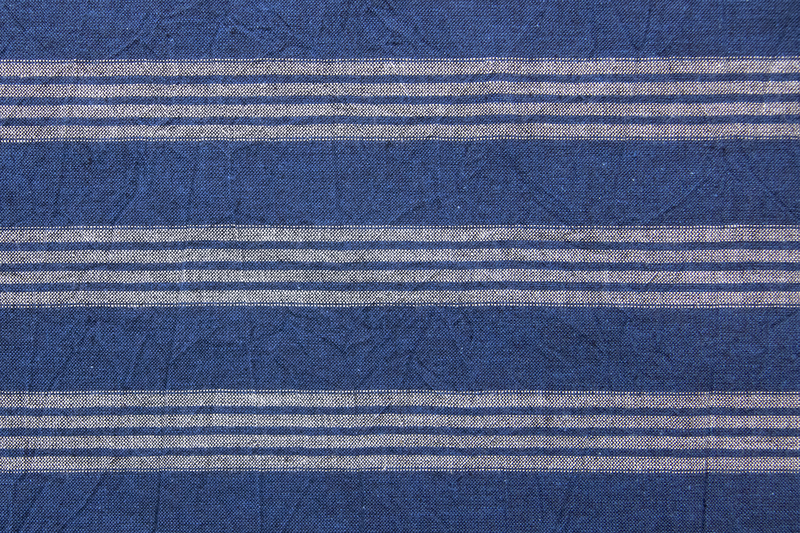 Kamedajima—a traditional fabric born in the Kameda area. Out of a desire to spread awareness and encourage people to incorporate the fabric into their daily lives, kamedajima’s producers spent the first four years after the revival actively participated in domestic and international trade fairs. Thanks to their tireless efforts, the fabric garnered attention for its high quality, traditional texture, and variety of beautiful stripes, and in 2009 the fabric passed a rigorous review and was registered as a regional collective trademark, becoming an official special product of Kameda, Konan Ward, Niigata City. Regional collective trademarks consist of a region name paired with a product, and signify that the product has passed a rigorous review verifying its general association with and close ties to a specific region.